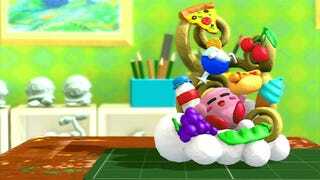 Kirby: Rainbow Curse has an art style not exactly common in games: one of clay. Everything in the game is made of it and it is animated as if it were claymation. And let me tell you, when you get a good look at the game up close, you'll wonder if it really is CG after all. Take the opening video, for example. Without knowing it was from a game, I'd assume that it was traditionally animated claymation. But even outside of the pre-rendered cutscenes, the game still looks amazing—especially the sprites. Your reward for finding hidden treasure chests in each level of the game is often a character model of Kirby or one of the game's enemies. You can then view these in the game’s gallery—which itself is set up to look like an art studio. Here you can see the models in all their detail. And yes, they do look real enough to touch. Kirby: Rainbow Curse was released in Japan for the Nintendo Wii U on January 22, 2015. It will be released in North America on February 20, 2015, and in PAL territories sometime in 2015.